Touring the nation this summer is the BELIEVE-IT TOUR (http://www.believeittour.com/), now in California and heading toward the Bigfoot Scenic Highway (State Route 96), from Willow Creek to Happy Camp. Recently, we at Bigfoot Books received a call from organizer and Believe-It member, Mike Esordi , and were invited to join them on the path up to the Patterson-Gimlin Bluff Creek film site. Unfortunately, their touring van might not do too well on that wretched road. Bobo was to be their guide, but apparently he has Flaming Lips tickets. So, we may be playing local tour guide. Some major out-of-the-area BF hunters are said to be attending, so keep watching. With recent mysterious noise-making activity reported (and recorded) in Bluff Creek, there may be some more documentable action this coming weekend! See Cliff Barackman's report on the noises here: http://northamericanbigfoot.blogspot.com/2009/08/bluff-creek-update.html. "Overview: Why as children are we so open to believe what as adults we are taught to reject? Mission Focus Areas: Paranormal, Cryptozoology, Extraterrestrial, Monsters, and Folklore. Our Vision: To strengthen our childhood beliefs—to think beyond the reality of what we see. Our Mission: To create a forum for believers in the five focus areas, to share their experiences and interact with one another, to encourage and revive childhood beliefs, and to build a community for all to participate from amateur to expert." 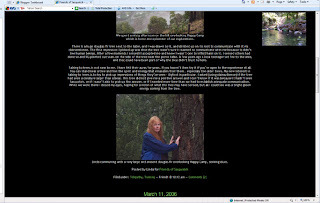 We've been receiving the interesting blog feed from Happy Camp Linda's BIGFOOT SIGHTINGS. Recent reports through the RSS feed have included a FLYING BIGFOOT and a STONE-AGE BIGFOOT FOOTPRINT, not to mention a strange one about an upright-walking human-like REPTILIAN creature. Check it out here: http://bigfootsightings.org/, and if you are interested in the Happy Camp area read her archived report here: http://bigfootsightings.org/2008/08/19/life-in-bigfoot-country-happy-camp-california/. It includes some cool photos of BF iconography in her area, including BIGFOOT TOWING's truck logo and the giant metal HAPPY CAMP BIGFOOT STATUE. Associated with the Happy Camp folks is another group, FRIENDS OF SASQUATCH, which seeks to use "psychic methods in exploring the nature of the Bigfoot phenomenon. 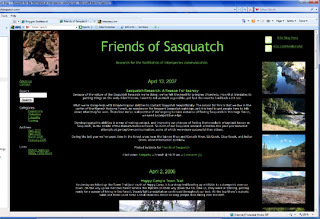 (The images are screen shots of the website of the group, which you should view here: http://friendsofsasquatch.com/). Since the creature is a "needle in a haystack" out there, their website says, means such as this can help in the perhaps otherwise nearly hopeless effort of finding it. In fact, the group seeks to make contact: "Our primary level of interest is the facilitation of interspecies communication." In the screen from the website viewed here one may see one of the group's members asking a tree if it has seen Sasquatch in its lifetime standing there. I quote: "Talking to trees is not new to me. I have felt their auras for years. If you haven’t then try it if you’re open to the experience at all. You can stand near a tree and feel the spirit and energy that emanates from them… especially the older trees. My new interest in talking to trees is to try to pick up impressions of things they’ve seen - Bigfoot in particular. I asked (using clairaudience) if the tree had seen a creature larger than a bear. This tree did not give me a positive answer and I don’t know if it was because it hadn’t seen Sasquatch, or if I wasn’t able to pick up the answer, or if I needed more time than we had to establish adequate communication. While we were there I closed my eyes, hoping for a vision of what the tree may have sensed, but all I could see was a bright green energy coming from the tree." Before you chuckle, heck, think about it. Maybe THIS is the secret method that the BFRO and other groups need? Maybe the communion-based approach can be more effective than the "hunt-and-capture" modality so many field researchers seem to use. Again, I quote: "Because of the nature of the Sasquatch Research we’re doing, we’ve felt the need for a degree of secrecy. 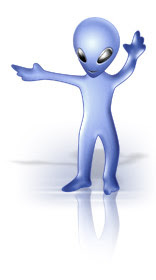 ...What we’re doing deals with broadening our abilities to contact Sasquatch telepathically. The reason for this is that we live in the center of the Klamath National Forest, an area known for frequent Sasquatch sightings, yet it is hard to get people here to talk about what they’ve seen. Therefore we’ve realized that if we’re going to have a chance of finding Sasquatch in this huge forest, we need a competitive edge. [WATCH OUT, BFRO and NABS!!!] Developing psychic abilities is a way of making contact, and improving our chances of finding that needle in a haystack known as Sasquatch, in the middle of the Klamath National Forest. So most of our Sasquatch research activities this past year included attempts at perceptive communication, some of which were more successful than others." I say, hmmm... all the more luck to them!!! "Ufologist Stanton Friedman spoke from Denver, where he'll be presenting at MUFON's 40th Annual International UFO Symposium this week. His topic at the conference is the 'Pseudoscience of Anti-Ufology.' There are a number of people who masquerade as scientific investigators of the UFO phenomenon, he said, but these debunkers don't actually investigate, nor are they scientific. He detailed the 'four basic rules of debunkers': What the public doesn't know, I'm not going to tell. Don't bother me with the facts, my mind is made up. If you can't attack the data, attack the people, it's easier. Do your research by proclamation--investigation is too much trouble, and nobody will notice the difference anyway." Bigfooters, TAKE HEART! 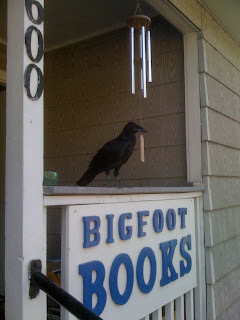 Meanwhile, a while back, a mysterious raven decided to make its perch on the front porch of Bigfoot Books. We were able to get up within a foot, with full eye contact. It did not fly away, apparently posing for this image. A new company logo? Or did it perhaps have other, more MYSTERIOUS motives? Great raven pic! Hope you're having a great summer. i wanta see the flying bigfoot! hey, when's the bigfoot parade thingy? isn't that coming up soon? Hi Steven! Thanks for mentioning Friends of Sasquatch on your blog. I read your posting to my partner and he was positively impressed and we are both grateful for your consideration regarding our Bigfoot research project. I just finished reading your entire blog and made it Bigfoot Site of the Day at Bigfoot Sightings.